The kids got gifts before leaving Honolulu, nice t-shirts from Therese for Alaska. They would like to say ” danke viel mol”! Thanks to everybody who joined or supported us, for the nice time which we could spend in Honolulu. After a rough but short transit from Honolulu (O’ahu) to Hanalei (north side of Kauai), we found a nice anchor place in the bay in front of the small but nice village. The island looks greener and wetter than O’ahu. Christina bought 2 ukuleles. I hope that we have some nice music evenings out at sea. Dario and the kids did a kayak tour on the river to explore the village. 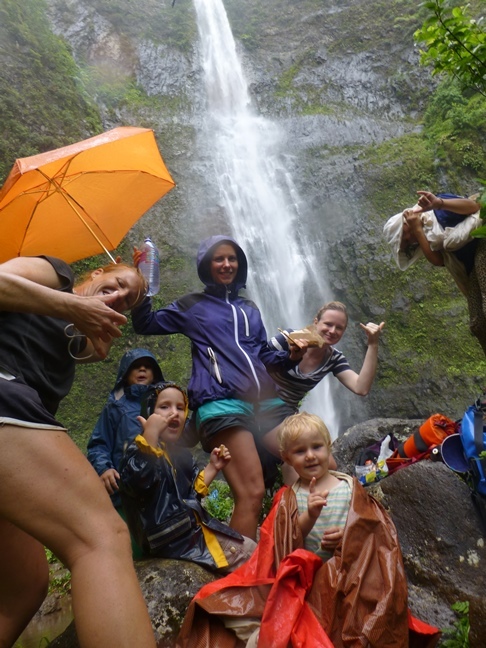 Tuesday, we did a hike to the Hanakapi’ai falls. It was a really nice walk 4 miles bidirectional along the high sea cliffs, and winds up and down across lush valleys. 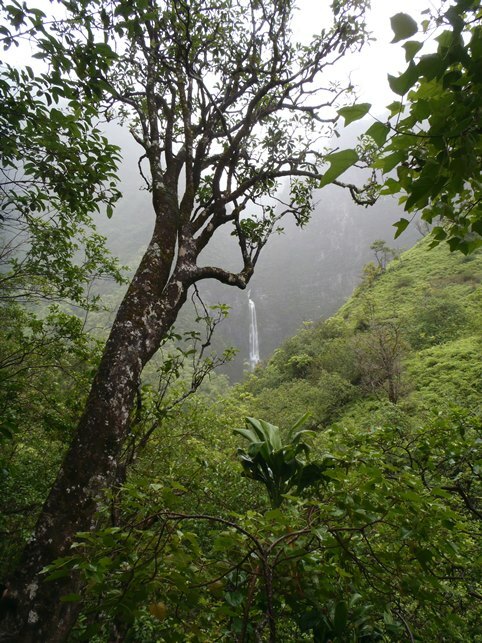 It’s the beginning of the famous Kalalan trail. 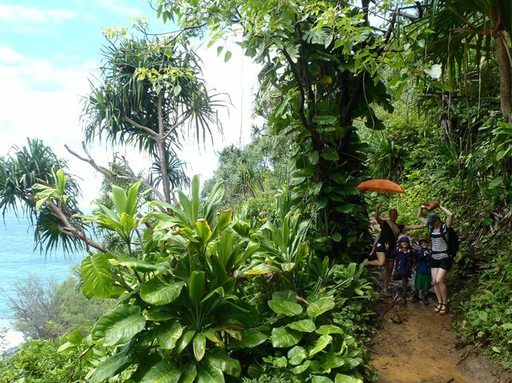 This trail takes several days and is for good hikers but the start is very popular. Tuesday it was raining and so there were not so much people. Beside the way we saw orchids, wildflowers, gave and mango trees, bamboo and eucalyptus. After 2 miles the way goes up the valley along the Kanakapi’ai stream in which a lots of small waterfalls flow. Everywhere on the way were black nuts – kukui (candlenuts) which the local use for the famous necklace from Hawaii. The falls were spectacular with a wide pool gentle enough for swimming. But it was too cold for swimming because we were so wet. The kids walked all along alone, 7 hours walk! They did a very good job! In return, we got invited for pizza from Lana. Thanks to her for the lift from the Ke’e beach and the pizza. Yesterday, Nic from Australia arrived on Pachamama. He will sail with us to Alaska for filming. Welcome on board. Today, before we leave Kauai for Alaska, we will have a clean-up on the beach from Hanalei. Everybody is welcome to join us.